Seventy years after we learned from newsreels and photographs and reports in the press of the Nazi extermination camps with their gas chambers, crematoriums and piles of corpses, we continue to ask ourselves two questions: Can we comprehend it? Can we comprehend the incomprehensible? 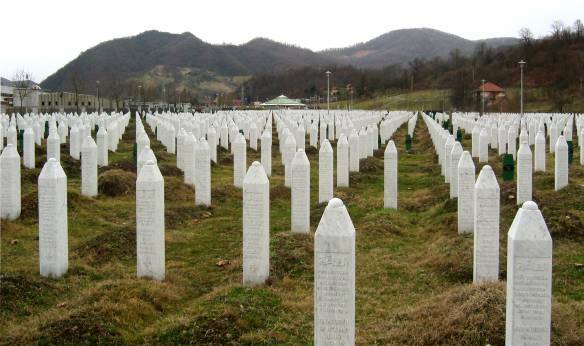 But then it happened again – massacres in Srebenica and elsewhere in the former Yugoslavia. Neighbours raped and killed each other; people who had co-existed apparently in peace became bitter enemies. Serbs murdered Bosnians and Kosovo-Albanians; the Croats not only destroyed the ancient and historically important stone bridge in Mostar, but also attacked women, children and the elderly, all of whom were completely unarmed. The Croats drove hundreds of thousands of Serbs from areas they had inhabited for centuries and that had been the Habsburg monarchy‘s line of defence against the Ottomans. And the Serbs retaliated by devastating Vukovar and turning it into the modern-day equivalent of Stalingrad. The Kosovo-Albanians and Bosnians responded with equal brutality to the Serb attacks. Evil reigned over the Balkans, a region not unfamiliar over the centuries with these kinds of events. Next we saw the Rwandan genocide. A million Tutsis and moderate Hutus were massacred but the world did nothing to intervene. And afterwards this incomprehensible tragedy was hushed up, even though there were wounds that could not be treated and that might never heal. Now that economic growth was on the agenda, no mention was to be made of the terrible events that had taken place. And French responsibility for these events was – and continues to be – downplayed. But even then the global community failed to learn enough to prevent new genocides in South Sudan, the Central African Republic and Syria. And what is it that we are now seeing in Iraq? Roma are not being massacred today, but they are discriminated against and persecuted. And they are referred to, as the Norwegian Prime Minister Erna Solberg quite rightly pointed out, in the same terms as those used by the Nazis when speaking of Jews. Erna Solberg deserves always to be remembered for her refusal as a cabinet minister to participate in the Holocaust remembrance ceremony at Akershus Pier in Oslo unless Roma and Travellers were also invited to attend. Now both groups are represented at the annual remembrance ceremony, together with homosexuals. The latter represent yet another group who were persecuted by the Nazis and who are now persecuted in Orthodox Russia and Orthodox Serbia, and who will once again come under threat in Poland if the arch-Catholic Kaczyński regains power. All these countries are so-called Christian nations. Nor is anti-Semitism dead. It is re-emerging not just in the Middle East, but also in Europe, even as we are finding out more and more about what happened over 70 years ago. In his book Bloodlands, Timothy Snyder shows how two-thirds of the six million murdered Jews had already been killed before the end of 1942, even though the industrialised killing at Auschwitz was yet to begin. At Auschwitz, Western European and Hungarian Jews were murdered along with Roma, Poles and Russians. We must not forget these last two groups, and we must remember that Auschwitz was neither a “Polish concentration camp”, as Obama described it, nor a concentration camp on “Polish territory”. At that time the region was part of Germany. The well known German historian Hans Momssen and other researchers have published new books that attempt to get us to comprehend the incomprehensible. And in his book Paragrafen [“The Paragraph”], Håkon Harket has documented how deeply rooted anti-Semitism was among Norwegians and how it was endemic among the founding fathers of Norway’s constitution in 1814. Jews were banned from Norway until 1851 – far more recently than in most other European countries. That Jesuits were also banned seems almost a curiosity when we consider that perhaps the most progressive and humane Pope we have had in recent times is a Jesuit. But although we are gradually obtaining more knowledge about what happened, it is difficult fully to absorb the information. I was obliged to do so, however, when I was invited to give a lecture at the Peace House in Risør in connection with the presentation of “The Prisoner’s Testament Award“, which is awarded jointly by the Risør-based organisation Travel for Peace and the Peace Research Institute Oslo (PRIO). “Do you really have to walk yet again in the valley of the shadow of death?”, asked my wife, who has experienced many years of harassment and threats due to my commitment to these issues. Here lay a village. Now it has disappeared. Here was a lily pond and a bridge. And tears at the black trees in the garden. Like a sombre and brave soldier. To shield the bird nests from the fire. There only the weeds take root. It smells of burning and decay. What have they done? Around us there are only graves. This is just how I feel when I travel in the “Bloodlands” – places where not only German Nazis, but also local populations, murdered Jews and where I am still aware of latent anti-Semitism. This text was published in Norwegian at Verdidebatt.no 24 June 2014: Kan vi fatte det ufattelige? Thanks to Georgina Berry and Martin Tegnander for their work on making Eduardas Miezelaitis’ poem as good as possible in translation from Norwegian to English, without knowledge of the Lithuanian original.